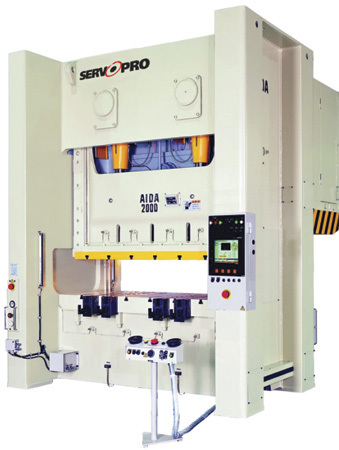 Aida-America, Dayton, OH, will exhibit and demonstrate two servo presses from its extensive range of metalforming solutions. An NS2-1600(D) 160-ton straightside servo press will be part of a completely functional line, stamping parts and presented at the show in cooperation with Formtek/CWP, Dayton Progress, AG Tool & Die and Anchor Danly. The press is provided courtesy of Royal Die & Stamping. The second press on display will be an NC1-1100(D) 110-ton gap-frame servo press, demonstrating the servo press' unique ability to reduce reverse tonnage. Both servo presses will allow attendees to evaluate how they can optimize flexibility through an infinite number of freely programmable, application-optimized speed, velocity and dwell profiles. Spot on with this write-up, I seriously think this web site needs far more attention. I'll probably be returning to see more, thanks for the info!